Intracranial arachnoid cysts (ACs) represent rare extra-axial CSF-containing lesions. Surgical management mainly depends on the cyst location and its size. Nevertheless, pure endoscopic fenestration represents a relatively straightforward and safe technique, and—in most cases—the treatment of choice for symptomatic intracranial ACs. The postoperative complication rate of the procedure is low including subdural hematomas, hygromas, and intraparenchymal hemorrhages. Symptomatic cerebral vasospasm after endoscopic treatment of ACs is a very uncommon event. To the authors’ knowledge, this adverse event in children has not yet been reported in the literature yet. 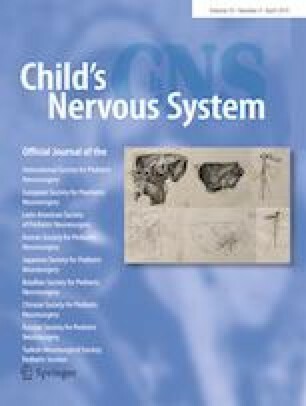 The authors present a case of a 9-year-old child developing an early symptomatic cerebral vasospasm with an insignificant secondary ischemia following endoscopic fenestration of a large temporal arachnoid cyst. The clinical approach, possible pathogenesis, and the therapeutic strategy is discussed particularly with regard to the literature. The online version of this article ( https://doi.org/10.1007/s00381-018-4011-7) contains supplementary material, which is available to authorized users. Joachim Oertel acts as consultant to Karl Storz SE Company. Stefan Linsler received honorarium for presentations from Karl Storz SE Company. Besides this, the authors certify that they have no affiliations with or involvement in any organization or entity with any financial interest, or non-financial interest in the subject matter or materials discussed in this manuscript. No funding was received for this research.